This is a simple 4 W fluorescent lamp driver circuit that can be operated from a 12 V supply.The first part of the circuit includes a NE555 timer IC wired as an astable multivibrator.The output pulses from the IC are amplified by the transistor Q1.The transformer steps up the collector voltage to around 1KVto drive the fluorescent lamp. Before using the circuit, set the R2 at full resistance and switch on the supply, now adjust R2 so that the collector current is 300mA (use a multimeter) and this is the optimum setting for the lamp.Operating the lamp in this setting will give a better life. Use heat sink for transistor Q1. Use a 3 V primary , 230 V secondary, 5W transformer for T1. 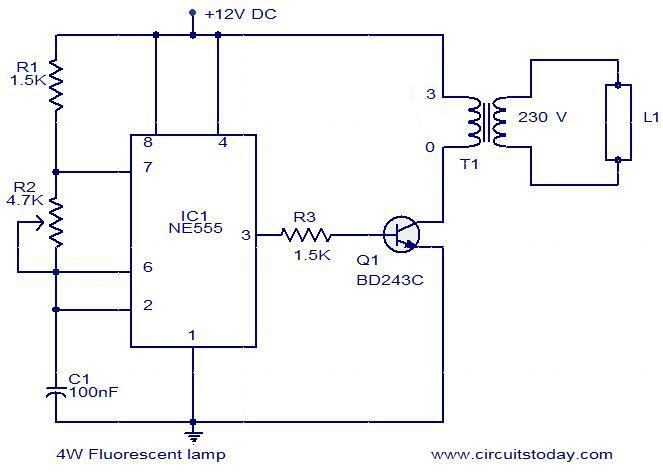 Power the circuit from a 12V battery or 12V DC power supply. The L1 can be a 6 inch, 4W fluorescent lamp. please help! !what are the functions of resistor R1,R2,R3 and capacitor C1? which transistor can be used instead of BD243C? Can I replace the 4W Fluorescent lamp to a 4W Black Light tube? Although the circuit will function there are several limitations. First, the tube is being started with cold cathodes. Tube life will be shortened as the cathode coating is gradually stripped. This isn’t just a feature of this circuit, but all those cheap battery operated torches having tubes with blackened ends. Incidentally, as there is a DC component present in the tube supply because of the single ended drive to the transformer, one end of the tube will wear out before the other. Because of the low efficiency of using a mains transformer (operating outside intended frequency range and with the interleaved core laminations saturating because of the DC component), the tube will not receive full 4W of power. Besides, 300mA @ 12V is only 3.6W. Therefore, it will not be as bright as one operated from the mains. A push pull converter, running at high frequency, using a ferrite transformer, and having filament windings to warm to cathodes is the best way to operate fluorescent tubes from low voltage DC. Can Q1 be replcd wit 2n3055 for beta result? sir this circuit can be improved by using 2n3055 for Q1 and 12v-230volt 1amp transformer to get an output of 8watt! Once Again A Really Nice Design,,Thanks!!! Hi Raptor one pin from each side to be used (as the heating is not require) since it is high frequency, high energy discharge. Hi Sugiman with a 3.7 volt 700mA battery, by using this circuit can illuminate 230volt 2.5 watts for 40 to 50 minutes. Try your luck. as these batteries available are not genuine. the flourescent lamp has 4 terminal the 2 terminals of every side joint with one another. then there will be remain 2 terminal only. Any way a 4W fluorescent lamp itself will be the best option.